I’m back!” As he proclaims with song and dance in a Broadway-inspired promotion of his famed chat show, Koffee with Karan, the iconic host is all set to celebrate the season with a return to the small screen. 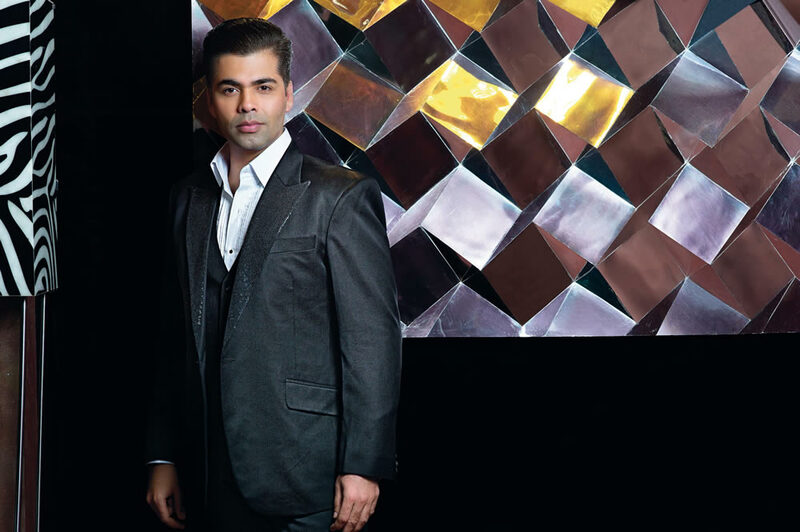 Karan Johar brings with him all the warmth, goodwill and, in a sense, the clout that comes with his real-life years in the industry – more than half of whom are childhood chums or people who have seen him grow up, personally and professionally. Those who know him well reiterate that he is a charming host – not just on TV but off it too – and a popular guest who keeps the conversation rolling with his inimitable sense of humour and one-liners. CELEBRATION IS AN EXPRESSION OF ECSTASY. It comes with your deep fulfilment, be it for an event, a date, the success of something or happiness at something. Celebration is also festive and comes with a marriage or a season, the birth of a child or a festival like Diwali. Rarely do we actually celebrate little moments which is what we should be doing. But we always look for that big date to celebrate – it is in our DNA to do that. But I feel a beautiful moment between two people should also be celebrated in some form or the other. That’s something we don’t do. Celebrations are always larger than life and in your face. The little subtle moments of life are what you wish you could celebrate, but you sometimes don’t because you’re not accustomed to. I GREW UP WHEN I REALISED I WAS BORN TO DO FILMS. For me, coming of age was a sense of inner realisation. It was a question of finding the answers that I had always searched for but didn’t have the strength, the gumption or the capacity to achieve – and finally I knew I could. It was the day I realised I genuinely want to be a filmmaker and I’m going to take that big step. This was during my first week as an assistant on my first film, Dilwale Dulhaniya Le Jaayenge. It was a remarkable moment; I still celebrate that feeling I had which set me on my journey. PARTIES MEANT DIFFERENT THINGS TO ME AT DIFFERENT TIMES. When I was in college, parties were fun, meant meeting new people; in my 20s, when I was in the movie business, it meant networking with your fraternity and getting to know people in your business and actually, building relationships. In the 30s, when I was already established, it meant literally trying to see where I belong. Today, parties are more like stress. I don’t enjoy parties any more. I have the most fun when I can be with close friends and put my feet up and just be myself. Today, when I attend a party, I am worried that there will be media outside, am I dressed for it – I have to give my photo, go inside, do the right thing, say the right thing, meet the right people, make all the right noises and come back – it’s no longer fun. YOU ARE STUCK WITH THE GROUP. I go now because one cannot suddenly vanish from the scene because people will think something’s wrong with you. So, it’s more like you’re meeting the expectations of others by attending social events, rather than doing it for yourself. And at parties you don’t talk to people you love – you meet and talk to people you don’t normally meet on a day-to-day basis. THE PERSONAL TOUCH IS IMPORTANT. When one is hosting a party, it is all okay to send fabulous invites, get great décor et al, but all that doesn’t matter if the personal touch is missing. When you invite people you have to make them feel special, not just at the do but even post the event by thanking them. And if you don’t feel the personal touch, it is not organically in you. You’ll never be a great party thrower. I think you have to be personal and personable about everything to do with the party. YOU CALL PEOPLE FOR VARIOUS REASONS. You call people you like. You sometimes call people you don’t like because you have to call them. But once you call them, they’re your guests and whoever they are, you have to go all out and make sure that they are comfortable, because they’ve come to your domain. The importance of respecting my guests is something that I have been trained to do by my parents. I CHOOSE WHERE I WANT TO GO. I am invited to many parties but I go when I know someone really well and sometimes because I am obligated to. Sometimes, I go because I feel that it would mean a lot to the hosts if I went or that it would upset and hurt them. So, there is sensitivity in making that decision. Often I don’t want to go because I am just one of the 3000 names they’ve called and I know it won’t really make a difference to them for they’re not really in my life or in my scheme of things. I just skip that party. UNLIKE YESTERYEAR, TODAY PARTIES HAVE BECOME A PAIN. When my parents went to parties or hosted them, throwing a party was fun; attending one was even more so. There was no media in your face. This is now some kind of invasion. So, for my 40th birthday celebrations, I made sure there was not a single camera inside. I did not even allow still photography. I didn’t care that I would not have those memories in a tangible form but I did not want anybody to feel invaded. Manish Malhotra actually did everything. He’s been my closest friend for over 20 years and he took complete charge of that party. I had nothing to do – all I did was show up. It was the one defining party of my life. My 40th was like my wedding. THE PARTY SCENE IS COMPLETELY LOW-BROW NOW. There were sophisticated, beautiful parties in the ’60s – with the piano and everybody around the stairs. The party scene is completely tacky now, unless it’s a specific big, large event. MY REAL-LIFE CELEBRATIONS ARE TERRIFIC. I just call a group of friends – we either go out for dinner or call them home. My best evenings have been spent at home with my friends. Six or seven of us indulge in random conversation. The energies of people who you’re close to gives meaning to the event – it is all about just hanging with them, without worrying about what you’re saying or doing. And that is what I love. ENERGIES FLY AROUND AT PARTIES. I’ve seen brawls and altercations at some parties. I suppose people don’t always meet each other and energies are flying around between two people. Parties are common ground where people do land up meeting. If two people have had a fight at a party, obviously, they’re already carrying some baggage against each other from the past for 100 reasons. At a party if you’re under the influence of alcohol, you’re a lot less controlled and you’re not self-policed – that can sometimes lead to an altercation. What and why are you celebrating? You don’t have to call the whole world and say you have made a hit film. I always feel success should be met with relief, and failure with contemplation. When you’re relieved, you move on to the next. You don’t stay there and ponder over its success. It’s done and gone, delivered. PARTYING LATE TAKES ITS TOLL. I am 41 years old now and when you party till late and have to wake up at eight or nine in the morning, it does mess up your day. You have to plan your next day accordingly if you know you are going to have a late night. Fortunately, I’m not in a 9-6 job so I can do that. I can structure my work around unless I’m shooting for a film. Then I definitely don’t party at all. I’m a people’s person. As a host on TV, I know where I can push the limit – I know how to protect the guest who has come in on my invitation and yet make it kind of fun. It’s really how you ask the question. If you’re going to make a sensational question sound sensational, you’re going to throw them off. The way you ask defines the conversation. And that is true in real life too. My own, when I turned 40. Mr. Bachchan’s 50th birthday party at the Taj, Mumbai. It was an elegant do. A friend’s wedding in the south of France, in Cannes. The shenanigans spanned three nights and all three were super fun. Parmeshwar Godrej – she’s a warm, compassionate and amazing host. Shah Rukh Khan – he is gracious and will drop you to your car. Arvind and Tanya Dubash – they throw the most fun evenings at home. The personal touch from the host. The least amount of media invasion. The right mix of people. What Makes Karan Johar A Bollywood Favourite?